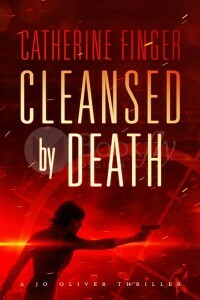 Cleansed By Death by Catherine Finger is book number one in the Jo Oliver series. It is a contemporary Christian thriller. The novel deals with the search for a serial killer led by female police chief Jo Oliver. Jo is also searching for God, and God is searching for Jo. Jo sees a lot of bad in the world and she has some tough questions for God – such as where is He when bad things happen? And why doesn’t He stop the evil? Catherine Finger shows that it’s ok for Christians to have questions. Some things we will never know the answer to this side of heaven. During the hard times God never leaves us, He walks alongside us. There is the area of growth within Cleansed By Death. It is during the trying and testing times that our characters grow and our relationship with God can strengthen if we choose to lean on Him. The need for prayer is demonstrated within the novel. Jo thanks a God she “hardly knows” and she prays to Him too. As her knowledge of Him grows, so will her trust and dependency. The novel deals with the tough area of domestic abuse. It shows how complex it can be, as the perpetrator continually promises never to do it again. Catherine Finger reveals how sometimes even powerful women can become victims and how they feel the need to hide the fact that they are victims as they feel ashamed. The abuse may go on for years unchecked until the woman has the strength to ask for help and the realisation that she is not “deserving it.” It was a difficult subject but tackled with great sensitivity. Cleansed By Death demonstrates the value of good friendships. When life is tough it is invaluable to have people around you whom you can trust and who are there for you. The character of Jo shows the importance of following God’s values and of keeping one’s eyes fixed on Him at all times. Cleansed By Death is written in the first person from the point of view of Jo. The reader becomes intimately acquainted with her. Catherine Finger is a new author to me. I really enjoyed her writing and am eagerly awaiting book two in the series.